You can enjoy CD and DVD audio by a natural, soft, delicate tone. Model_2 converts not only the conventional digital audio signal of CD, MD, and DAT, but also the DVD digital audio signal of the latest 96KHz/24 bit sampling, into a high-quality analog signal. The 96KHz/24 bit sampling realizes the wideband sound, which extends to 48KHz, and a great dynamic range. Please enjoy the world of a new digital sound. In addition, our latest digital circuit reproduces past CD by better tone quality. All analog circuits of Model_2 are composed of non negative-feedback circuit with vacuum tubes. A warm, soft tone of the vacuum tube will improve the tone quality of a digital equipment which makes easily tone cold and inorganic. A strong error correction protects a digital reproduction of CD and DVD. The sound dose not stop even if a little reproduction error occurs. However, the quality of the reproduction is deteriorated by the error. Model_2 has the status display and four digits error counter. It is useful though knows the working condition of your system as follows. Condition of readout of CD and DVD transport. Suitability of the transmission cable between transport and DA converter. Number of errors due to dirts and wounds on CD and DVD. The price of Model 2 is US$650. You can enjoy the latest 96KHz/24 bit sampling digital sound by the combination of Model_2 and DVD player in low cost. We use 6DJ8 tube in Model_2. 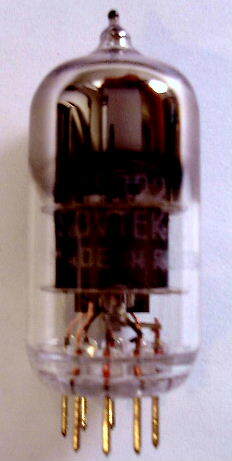 6DJ8 is a vacuum tube which is developed at the end period of the vacuum tube age and characterized by a low noise, wideband. 6DJ8 was used to the amplification of high frequencies such as communications and TV. 6DJ8 has the high performance to be used also for the analogue part of latest DA converter. Digital inputs 75 Ohm SP/DIF(RCA), Toslink Optical.